TWR history goes under the hammer. Following the liquidation of the TWR Group the receivers appointed auctioneers Wyles, Hardy & Co to dispose of the collection of Racing Sports cars and memorabilia. At the auction held today at the Brands Hatch circuit two important cars were the stars of the show. Sold for £99,000 the Jaguar XJ-S Group ‘A’ Race Car (TWR JC-84A 007) from 1984 will return to its birthplace as it was purchased by the Jaguar Daimler Heritage Trust. 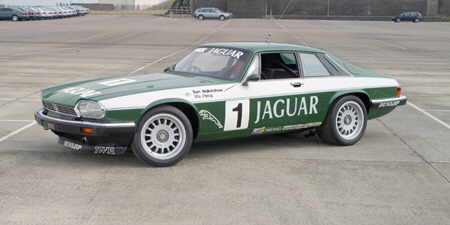 1982 saw the beginning of TWR’s long and highly successful association with Jaguar when the company first built and raced the XJ-S in the European Touring Car Championship (ETCC) running to the new Group ‘A’ regulations. With a single entry for most of the eleven races Tow Walkinshaw partnered mostly by Chuck Nicholson scored three outright victories helping Walkinshaw to 3rd overall in the Championship. The following year the team entered two cars for most events, scoring six victories with Walkinshaw now finishing 2nd overall. In 1984 a full three car team was fielded with a driver line up including Walkinshaw, Win Percy, Hans Heyer, Chuck Nicholson, Enzo Calderari and Martin Brundle. New cars were built for the season which were a significant improvement over the previous years being both lighter and with more powerful engines, developed by TWR using Lucas electronic fuel injection, developing 450bhp at 7300rpm. A Getrag five-speed gearbox also replaced the standard four-speed unit. All were fitted with 17 inch Speedline wheels enabling the use of massive 14 inch diameter brake discs Between them the drivers scored seven outright wins with a further victory at the non championship Macau race and Walkinshaw was finally crowned European Champion. The following year the mighty Jaguars were replaced in the ETCC by the Bastos sponsored Rover Vitesse V8’s, however they were brought out of retirement for the odd race such as Bathurst in1985 and Wellington in 1987. Walkinshaw also drove one round the Millbrook test track in Bedfordshire at a calculated one lap average of 176 mph. This example carries chassis number 007 and a build date of January 1984. Apart from the improved specification detailed above it has Perspex side windows and is fitted with a full roll cage which extends through the bulkheads and a Recaro race bucket seat. There is a large plastic tank in the passenger foot well which holds water for the brake cooling system. Chassis 007 was the car used by Tom Walkinshaw throughout the 1984 season during which he scored four 1st places, one 2nd place and two 3rd’s on his way to becoming Driver’s Champion, including victory in the Spa 24 hour race with Win Percy and Hans Heyer. 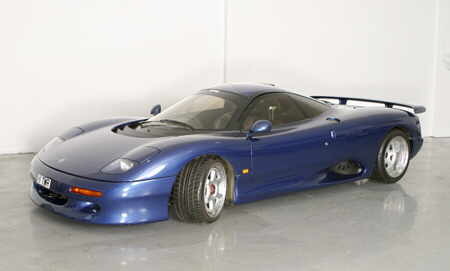 A Jaguar XJR 15 number R9R (R9R 01/90) was sold for over £95,000. The original prototype was based on the TWR Jaguar Le Mans winning V12 racing cars, using the same monocoque as the successful XJR series Group C cars designed by Tony Southgate. The concept was to create an exclusive ‘limited edition’ road going race car that capitalised on Jaguar and TWR’s recent successes, particularly at Le Mans. The XJR-15 was then announced, with the intriguing option that on purchase each car could be entered (using only professional drivers) in the Jaguar Sport Intercontinental Challenge, a three race competition held during 1991. Drivers included Brabham, Jones, Warwick, and Hahne (who won the series) and the handsome $1,000,000 prize fund. Utilising a 6000cc V12, 450bhp dry sump engine, TWR six speed transmission, with a carbon clutch, the claimed top speed of the road going car was 215mph. This motor car is in dark blue finish with a grey leather interior, the rear tinted acrylic screen is cracked. The car was registered H1TWR but this was removed prior to sale. The chassis plate fixed to the vehicle, gives the chassis number R9R 01/90 and a build date of September 1990, the registration document shows a first registration date of 1/11/90. However TWR’s build sheets and associated records show that the car commenced ‘rebuild’ on October 1st 1994 and was completed on December 4th 1995 – with the reference number 001. The build documentation for 001 details engine number XJR-15-50 and gearbox number VGC6RD-19 as being fitted to the car, the engine number fitted to the car included in the sale reads XJR-15050 and the gearbox number VGC6RD19.